Skillet is an American Christian rock band formed in Memphis, Tennessee, in 1996. The band currently consists of husband John (lead vocals, bass) and wife Korey Cooper (rhythm guitar, keyboards, backing vocals) along with Jen Ledger (drums, vocals) and Seth Morrison (lead guitar). The band has released ten albums, with two, Collide and Comatose, receiving Grammy nominations. Two of their albums, Comatose and Awake, are certified Platinum and Double Platinum respectively by the RIAA while Rise is certified Gold as of November 10, 2017[update]. Skillet at the Road to Rise VIP experience in Nashville, Tennessee, on June 14, 2013. From left to right: Seth Morrison, Korey Cooper, John Cooper and Jen Ledger. Skillet went through several line-up changes early in their career, leaving founder John Cooper as the only original member remaining in the band. They are known for a relentless touring schedule, which garnered them a top five ranking in the Hardest Working Bands of 2010 by Songkick.com. Skillet formed in 1996 with two members: John Cooper, former vocalist for Tennessee progressive rock band Seraph, and Ken Steorts, former guitarist for Urgent Cry. The two bands met through touring together, but those bands disbanded soon after, so John and Ken's pastor encouraged them to form their own band as a side-project. They decided to name the experiment 'Skillet'. After, Trey McClurkin joined the band as a temporary drummer. Skillet was only together for a month when they received interest from major Christian record label ForeFront Records. In 1996 they released a self-titled debut Skillet. It was well-received, and the trio continued to write new material as they toured the United States. The question behind the name of the band, 'Skillet', comes up often among fans and the band itself. John Cooper, the lead vocalist and founder, explains that the name was a joke at first. The two founding members had already been in different bands, with each band having a different sound and style to its music. Cooper tells that the side project was said to be like putting all of those styles in a big skillet to come up with something unique, hence the band name 'Skillet'. The band name is still somewhat of a joke between the band members, especially Cooper, who claims to still not like the title. Skillet recorded their follow-up album throughout 1997, titled Hey You, I Love Your Soul, which was released in April 1998. Their second effort was a change in style from the band's first release. With this release, Skillet would abandon their post-grunge approach for a lighter alternative rock and style. His wife Korey was enlisted soon after to play keyboards live in order to alleviate John's live performance duties. Shortly before the band began recording for their third album, Invincible, Steorts left the band to be with his family and launch Visible Music College, a modern music ministry college located in Memphis, and Kevin Haaland joined the band as their new guitarist. Korey Cooper joined the band permanently and played keyboards for the recording of Invincible. Because of this change, the musical style on Invincible changed to a more electronic sound. Soon after the release of Invincible in early 2000, Trey McClurkin parted ways with Skillet, and Lori Peters filled the drummer's position. The band released their first worship album, and fourth album overall, Ardent Worship in late 2000. The band kept much of their sound from Invincible on their next album Alien Youth. With little time between touring and recording, Skillet released Alien Youth on August 28, 2001, which was the first album that John Cooper took on production duties. Before the release of Alien Youth, Haaland left the band, and Ben Kasica took over on guitar. In 2003, Collide, the band's sixth studio album, was released by Ardent Records and contained the singles "Savior" and "Collide". In 2004, the rights to Collide were bought by Lava Records, an imprint of Atlantic Records. On May 25, 2004, Collide was re-released by Lava Records, with "Open Wounds" as an added track. The album was nominated for "Best Rock Gospel Album" in 2005. Citing P.O.D. as inspiration for the musical shift on Collide, Cooper said, "Well I'm one of these song writers, everything I hear goes through my John Cooper filter of what I like and what I don't like. [...] All these things [...] have been an influence on me." Skillet's album Comatose was released on October 3, 2006. It features the singles "Rebirthing," "Whispers in the Dark," "Comatose," "The Older I Get," "Those Nights," "The Last Night", and "Better Than Drugs". The album debuted at No. 55 on the Billboard 200 and No. 4 on the US Top Christian Albums chart. On October 21, 2008, Comatose Comes Alive was released; a CD/DVD combo featuring live recordings of the band's May 9, 2008 concert in Chattanooga, Tennessee. It was shown on the Gospel Music Channel on December 5, 2008. Skillet's Comatose Comes Alive CD also had a B-side with "Live Free or Let Me Die" as a single, also with five acoustic tracks which purchasers could download by inserting the CD in their computer. Skillet's eighth album, Awake, contains twelve songs and was released on August 25, 2009. It charted at No. 2 on the Billboard top 200 selling around 68,000 units in its first week. "Monster" was released as a single on July 14, 2009. Contrary to popular belief, John Cooper stated that "Hero" was not the album's lead single. It was, however, released as a single in March 2010. They also released a deluxe version with the extra songs "Dead Inside" and "Would It Matter", along with the original, radio edit of "Monster" that does not have the distorted growl as in the single and in the CD. A remix on "Monster" was featured on one of their popular podcasts.The song "Hero" was used in the publicizing of the first football game of the 2009 NFL season between the Pittsburgh Steelers and Tennessee Titans, and the song "Monster" was used in the episode "Jason: The Pretty-Boy Bully" on MTV's Bully Beatdown. "Monster" was the theme song for the WWE event WWE Hell in a Cell while the song "Hero" was the theme song for WWE Tribute to the Troops and Royal Rumble 2010, as well as both songs being included on the official soundtrack for the WWE video game WWE SmackDown vs. Raw 2010. "Monster" would also become the theme song for the AHL team the Lake Erie Monsters in Cleveland, Ohio, being played in the player intros and after a Lake Erie goal, and serves as the opening theme of the Fresno Monsters of Fresno, California. "Monster" was aired at the beginning of several ACC football games on Raycom Sports during the 2009 season. In the first week of April 2010, "Monster" was released for the Rock band music store in Rock Band 2 It also tied the record for highest-charting Christian album on the Billboard 200 with Underoath's 2006 release Define the Great Line and Casting Crowns' 2007 release The Altar and the Door, as all three albums debuted at No. 2. Skillet was nominated for six Dove Awards for the 41st Annual GMA Dove Awards. Awake was certified gold July 2, 2010. Also in 2010, Ardent released The Early Years, a collection of their songs from 1996 to 2001. On November 12, Skillet released an iTunes sessions EP consisting of songs from Comatose and Awake. "Monster" was certified gold a day later. Skillet announced the release of Awake and Remixed EP in early March 2011. The remixes were mainly done by Korey Cooper and Ben Kasica. On March 2, 2011, Skillet unveiled the album artwork for the album. John Cooper says the idea was conceived when Korey Cooper and Ben Kasica remixed the song Monster for their popular podcast. The four-song EP was released on March 22. "Awake" was nominated for and won the "Top Christian Album" Award at the Billboard Music Awards 2011, and the song "Awake and Alive" was announced to be on the Transformers: Dark of the Moon Soundtrack in May 2011. On June 21, 2011 John posted to his Twitter account that the band rehearsed new music for the first time and that they are getting ready for a new album. At a question and answer session before a concert, John Cooper said that they would be recording a new record in January/February 2012. However, the band was then scheduled to headline the WinterJam Tour. They planned to enter the studio at the conclusion of the Winter Jam eastern tour, approximately in May, for a release in late 2012. In an interview with CCM Magazine, John Cooper described the new album as "a roller coaster ride". He states: "We have aggressive tracks, artsy and musical tracks, which is new territory for Skillet. A couple songs are classic American heartland anthems, and a couple songs are signature symphonic-classical rock Skillet. Guitars are dirty and edgier, with absolute shredding solos by Seth." One of the songs mentioned in the interview was titled "Salvation". In an Interview on January 26, 2013 in Beaumont TX, John Cooper announced that the new album, Rise, would be coming out in May 2013, but was later scheduled for a June 25, 2013 release. In an interview with NoiseCreep, John Cooper stated the first single and music video is scheduled to be released by late April. The first single from the album, "Sick of It", will be released to US Rock radio on April 23, 2013. It was later confirmed that the first single, "Sick of It", would be released on April 9, 2013. The album debuted at No.4 on the Billboard 200 and No.1 on the Top Rock Chart and Christian Album charts selling 60,000 copies in US alone during the first week of the release. On July 12, 2016, Rise was certified Gold by the RIAA. The band performed the title track off Rise on the July 11, 2013 airing of Conan. Skillet was nominated and won a Dove Award for Rock Song of the Year for their song "Sick of It". Vital Signs, a compilation album released exclusively in Europe, was released October 13, 2014. On February 16, 2015 Skillet announced they were writing material for a new album with recording to begin in June with a potential release in the late half of 2015 or early 2016. On April 8, Skillet released a preview of a new song, later revealed to be called "Out of Hell", on their social media pages. On May 20, 2016 the album's title, Unleashed, was announced and later was released on August 5, 2016 on Atlantic Records. A lyric video, "Feel Invincible", was also made available. On May 26, the lyric video and digital single "Stars" was released, along with a preview for another song titled "Back From the Dead". On June 6, it was announced that "Feel Invincible" was the theme song for TBS' E-League, the live video game tournament. WWE announced on July 7 that it had chosen "Feel Invincible" as an official theme for WWE Battleground. On July 8, the full version of "Back From the Dead" was made available for purchase online. On January 27, 2017 the band released a new recording of "Stars" with an acoustic style, which was included in the film, The Shack. On November 17, 2017, they released a deluxe edition, Unleashed Beyond, containing new material such as "Breaking Free", featuring Lacey Sturm and remixes of "Feel Invincible" and "The Resistance". Skillet also released a five-track EP containing remixes of "Feel Invincible". This was available to anyone who pre-ordered Unleashed Beyond from their website. The band's style has been described as Christian rock, Christian metal, alternative rock, hard rock, nu metal, and symphonic metal. The band's eponymous debut album was characterized by its grunge influences, while their follow-up album, Hey You, I Love Your Soul was noted for "its electronic elements and industrial feel." Their music can also be described as an aspiration; according to Cooper's idea for a perfect music is to 'unite' individuals spiritually and socially.Allmusic reviewer James Christopher Monger described the band's musical style as a fusion of "alt-metal, hard rock, post-grunge, and soaring alternative rock," in his review for the band's 2013 album, Rise. In the middle of 2005, Korey Cooper took a break from performing, due to her pregnancy with their second child. Her rhythm guitar and keyboard roles were temporarily filled by two people: Andrea Winchell (who would later become the Coopers' nanny) on keys and Chris Marvin (lead singer/guitar of The Spark) on guitar. Skillet toured with Ron Luce and Teen Mania Ministries on their Acquire The Fire Tour across the United States and Canada in 2007. When they returned, Skillet had plans to co-headline the Justice & Mercy Tour with Flyleaf, but the tour was postponed and ultimately canceled after a number of shows due to Flyleaf lead vocalist Lacey Mosley's vocal problems. They then toured with Luce's Global Expeditions program on a summer missions trip with teenagers to Mexico. In 2008, they joined Teen Mania Ministries and toured with Acquire the Fire. Skillet appeared at the 2009 Night of Joy Christian rock festival at Disney's Hollywood Studios at Walt Disney World. This marked the band's first absence from Universal Studios Orlando's Rock the Universe in five years due to conflicting schedules. However, they were able to perform the following year, in 2010. On September 26, 2009, Skillet appeared at Awakening Music Festival in Leesburg, Virginia, alongside Jeremy Camp, Kutless, Hawk Nelson, Disciple, Decyfer Down, and others. Skillet also played at the Super Dome in New Orleans for the ELCA National Youth Gathering in 2009. In January 2010, they toured with Puddle of Mudd and Shinedown through the East Coast of the United States. They also announced on their live chat with fans on December 5, 2009 that they would be touring with TobyMac in March and April 2010. This was later expanded upon as the "Awake Tonight Tour" named after both artists' new albums. House of Heroes joined them on the tour as the opening act. In April and May, the band continued on a second branch of their Awake and Alive tour with The Letter Black and Red. In April, it was also announced that the band would be touring with Creed and Theft in August and September 2010. In October, the band will be co-headlining the "Monsters of Annihilation Tour" with Papa Roach. Trapt and My Darkest Days will be supporting acts. They toured again with TobyMac in November and December as the 2010 version of the Winter Wonder Slam tour. On July 4, Skillet played at Creation Festival East, and John Cooper called it the best show of Skillet's career. In January 2011, Skillet confirmed that they would be touring with Stone Sour and Theory of a Deadman on the Avalanche Tour. The tour began at the end of March 2011 and concluded on May 8 in Jacksonville, FL. Other supporting acts include Halestorm and Art of Dying. The band had a small international tour in January and February 2011 visiting Australia, New Zealand's Parachute Music Festival, and Japan. In October 2011, the band continued their Awake and Alive tour with Disciple, We as Human, and Manafest. Skillet headlined the Winter Jam Tour 2012 for the central and eastern parts of the United States. Starting on August 13, 2013, Skillet toured with Shinedown, Papa Roach, and In This Moment on the Carnival of Madness Tour. In October and November, the band arrives Europe supporting Nickelback's tour in twenty one shows. The band closed the year headlining their own tour in Russia and a show in Ukraine. Skillet started coheadlining the Roadshow 2014 with Third Day during January and February. Upon completion, the band continued coheadlining alongside Third Day in a spring tour. Later in May, toured with TobyMac and Lecrae in the Summer Shed Tour. Starting in the end of May, the band traveled to be part of European festivals during six weeks. In August and September, they joined Godsmack, Seether, and Buckcherry in the Rockstar Uproar Festival in twenty one American cities. In October and November, the band had its own tour in Europe and Russia, offering twenty-two shows. Starting January 2, 2015, they will co-headline the Winter Jam Tour 2015 in the central and eastern part of the United States alongside Jeremy Camp. They will also be part of the Winter Jam Tour 2015 West Coast. On May 11, 2016, Skillet announced a European tour from May 28 through July 3 including Rock am Ring. In July 2016, it was announced that Skillet would be going on a headlining Unleashed Tour with Sick Puppies, Thousand Foot Krutch, and Devour the Day, playing at club-sized venues in 18 cities primarily located along the East Coast of the United States to take place during September and October 2016. In December 2016, a 27-city, second leg of the tour was announced. Opening for Skillet on this second leg were Sick Puppies and Devour the Day. In 2017, Skillet opened for Korn and Stone Sour on the second half of The Serenity of Summer Tour which started in Syracuse, New York on July 19 and finished in Cleveland, Ohio August 2. Starting November 5, 2017, Skillet joined Britt Nicole, Colton Dixon, Tauren Wells, and Gawvi for five shows on the Air1 Hits Tour across the central United States. In 2018, Skillet headlined the Winter Jam tour for the third time, making it their fourth appearance to date. Other bands that appeared on the 2018 Winter Jam tour include Kari Jobe, Cody Carnes, Building 429, Newsong, Jordan Feliz, and comedian John Crist, among others. In January 2018, Skillet announced they would be partnering with For King & Country to present the "joy. UNLEASHED" tour in April 2018, hitting a handful of mid-western and southern US cities. Skillet was recognized on February 1, 2016 as having recorded the biggest digital single in the history of Christian Music since their song "Monster" has garnered over 2.6 million sales. It was certified 2x Platinum by the RIAA, was the number one streaming Christian song of 2015, and was the number eight streaming rock song of 2015. ^ CCMMagazine.com: Skillet Closes Out 2007 With Grammy Nomination Archived December 18, 2007, at the Wayback Machine. Retrieved March 13, 2008. ^ "Gold & Platinum - RIAA". Retrieved November 10, 2017. ^ "Music News, May 2011: Skillet Scores First Billboard Music Award for "Top Christian Album" with Gold – Certified AWAKE". Jesusfreakhideout.com. May 24, 2011. Retrieved March 23, 2013. ^ "Skillet – "Alien Youth" Album EPK". YouTube. Retrieved July 6, 2011. ^ a b Shari Lloyd. "Skillet – a Review of The Phantom Tollbooth". Tollbooth.org. Retrieved September 6, 2011. ^ a b "Skillet - Chart history". Billboard. September 12, 2009. Retrieved August 9, 2016. ^ "New Drummer: Drummer Lori Peters leaves skillet, Replaced by Jen Ledger – Jan 23, 2008". crossrhythms.co.uk. January 2008. Archived from the original on July 19, 2014. ^ "Gold & Platinum - RIAA". Retrieved September 30, 2016. ^ "Awake and Alive with Skillet". May 6, 2010. ^ "CCM – April 2009". Nxtbook.com. April 2009. pp. 4–5. Retrieved July 29, 2009. ^ "The Band Skillet "AWAKE" on ABC News Radio". YouTube. February 3, 2010. Retrieved July 6, 2011. ^ "Rockband – April 2010 ". Rockband.com. April 2010. Archived from the original on April 5, 2010. Retrieved April 2, 2010. ^ "Awake – Skillet". Billboard. Retrieved July 6, 2011. ^ "41st Annual GMA Dove Awards nominees announced | The Tennessean". Blogs.tennessean.com. February 18, 2010. Retrieved July 6, 2011. ^ "Part 520". Ardent Records. Archived from the original on April 15, 2012. Retrieved July 6, 2011. ^ "Skillet | All Access Rock Music Magazine". Allaccessmagazine.com. Archived from the original on September 19, 2010. Retrieved July 6, 2011. ^ "The One with a New Member – Skillet Podcast". YouTube. August 15, 2010. Retrieved July 6, 2011. ^ "Skillet, "iTunes Session" Review". Jesusfreakhideout.com. November 12, 2010. Retrieved July 6, 2011. ^ "Music News, November 2010: SKILLET'S MASSIVE HIT "MONSTER" GOES GOLD AS BAND RACKS UP ANOTHER No. 1 SINGLE". Jesusfreakhideout.com. Retrieved July 6, 2011. ^ "Important Message from Skillet". February 14, 2011. Retrieved February 14, 2011. ^ "Ben Kasica (BenKasica) on Twitter". Twitter. Retrieved July 6, 2011. ^ "Skillet's New Guitarist Is... – Discussion Detail". skillet.com. Archived from the original on November 20, 2012. Retrieved July 6, 2011. ^ John Cooper (March 2, 2011). "Skillet "Awake And Remixed" EP Album Art!". Archived from the original on July 16, 2011. Retrieved March 2, 2011. ^ "Skillet Scores First Billboard Music Award And Lands Coveted Spot on Transformers 3 Soundtrack! – Blog Detail". skillet.com. May 26, 2011. Archived from the original on August 9, 2011. Retrieved July 6, 2011. ^ John Cooper. "We r rehearsing new music". Twitter. Retrieved June 22, 2011. ^ "Skillet's John Cooper talks about WinterJam event at BOK". Tulsa World. February 23, 2012. Retrieved July 12, 2012. ^ "Get the inside scoup with CCM Magazine's "In the Studio" feature on Skillet! - Skillet Official Blog". Skillet.com. February 13, 2012. Retrieved January 28, 2013. ^ "Skillet New Album "Rise" May 2013 Release". March 15, 2013. Archived from the original on March 9, 2013. ^ "Upcoming Christian Music New Releases". NewReleaseTuesday.com. March 19, 2013. Retrieved March 23, 2013. ^ "New Album RISE coming June 25!". Skillet.com. March 27, 2013. Retrieved March 27, 2013. ^ "Skillet Frontman John Cooper on Their Next Album: 'We've All Been Listening to More Edgier, Indie, Alt Bands'". February 6, 2013. ^ "Rock Future Releases | Rock Music Radio Songs' Release Dates". AllAccess.com. Retrieved March 26, 2013. ^ ""Sick of It" Teaser and Photo Submissions". Skillet. March 7, 2013. Archived from the original on April 17, 2013. Retrieved April 7, 2013. ^ Caulfield, Keith. "Wale Scores First No. 1 Album on Billboard 200 Chart". Billboard.com. Retrieved July 5, 2013. ^ "Gold & Platinum Search Results for Skillet". riaa.com. Retrieved July 14, 2016. ^ "Skillet Rocks Late Night Audiences with their Performance of "Rise" on CONAN". July 12, 2013. Retrieved September 8, 2013. ^ "Vital Signs". Last.fm. Retrieved November 29, 2014. ^ "Skillet Announces European Album "Vital Signs" and European Tour Details". Retrieved November 29, 2014. ^ Chad Childers (February 16, 2015). "Skillet 'Halfway There' in Writing Next Studio Album". ^ "Skillet Music". Retrieved July 10, 2016. ^ "Amazon.com: Unleashed: Skillet: MP3 Downloads". Retrieved May 21, 2016. ^ "Skillet Releases New Single, New Album Available For Pre-Order". Retrieved May 20, 2016. ^ "Skillet Premieres New Single "Stars"". Retrieved July 10, 2016. ^ "SKILLET'S "FEEL INVINCIBLE" NAMED THEME SONG FOR TBS' E-LEAGUE". Retrieved April 27, 2017. ^ "SKILLET TO RELEASE UNLEASHED BEYOND ON NOVEMBER 17TH - Skillet Official Blog". Skillet Official Website. Retrieved January 12, 2018. ^ a b Ankeny, Jason. "Skillet – Artist Biography". AllMusic. All Media Network. Retrieved February 13, 2016. ^ a b c Vitoulis, Alex (July 9, 2013). "Skillet Performs, Talks Crossover Success in Chart Beat Meet & Greet (Video)". Billboard. Retrieved November 25, 2013. ^ a b Newman, Melinda (June 24, 2013). "Skillet's 'Rise' burns with intensity: Album review". HitFix. Retrieved November 25, 2013. ^ a b c Kupiszewski, Ben (September 11, 2009). "Skillet's back and pissed off". MOVE Magazine. The Maneater. Archived from the original on March 21, 2012. Retrieved May 25, 2011. ^ Schoof, Dustin (January 11, 2010). "Shinedown, Puddle of Mudd and Skillet to rock Stabler Arena". lehighvalleylive.com. PennLive. Retrieved May 25, 2011. ^ DiBiase, John (January 3, 1998). "Skillet Hey You, I Love Your Soul Review". jesusfreakhideout.com. Retrieved March 1, 2011. ^ "Skillet Artist Profile | Biography And Discography". NewReleaseToday. Retrieved August 9, 2016. ^ Christopher Monger, James. "Skillet - Rise". Allmusic. Retrieved November 26, 2013. ^ "IGN: Breaking Benjamin Fall Tour Schedule". Music.ign.com. July 13, 2007. Archived from the original on November 20, 2012. Retrieved July 6, 2011. ^ "Awake & Alive Tour". skillet.com. Retrieved August 9, 2009. ^ "Skillet Announce New Tour With Shinedown And Puddle of Mudd". TuneLab. Retrieved July 6, 2011. ^ "SHINEDOWN, PUDDLE OF MUDD, SKILLET TEAMING FOR 2010 TREK | 93.3 WMMR: Everything That Rocks". Wmmr.com. November 17, 2009. Archived from the original on March 14, 2012. Retrieved July 6, 2011. ^ "Awake and Alive Tour". Itickets.com. Archived from the original on April 1, 2010. Retrieved July 6, 2011. ^ "Skillet 2011 Tour Dates – Christian Rockers Skillet on Tour". Christianmusic.about.com. May 11, 2011. Retrieved July 6, 2011. ^ "Creed | Gratis muziek, tourneedata, foto's, video's". Myspace.com. Retrieved July 6, 2011. ^ "Papa Roach and Skillet Announce Co-Headlining US Monsters of Annihilation Tour". Marketwire.com. August 24, 2010. Retrieved July 6, 2011. ^ "Winter Wonder Slam 2011". Winterwonderslam.com. Archived from the original on December 9, 2010. Retrieved July 6, 2011. ^ Cooper, John. "John Cooper Quote". Retrieved July 8, 2011. ^ "Past Tours & Events – Skillet". Red Ant Touring. Archived from the original on August 25, 2011. Retrieved July 6, 2011. ^ "Parachute 2011 -Artists". Parachutemusic.com. February 3, 2011. Archived from the original on July 20, 2011. Retrieved July 6, 2011. ^ "Skillet To Headline Winter Jam 2012". Pollstar. October 25, 2011. Retrieved September 13, 2018. ^ "A Night at WinterJam 2012 | AN EXCLUSIVE NRT TOUR REPORT". NewReleaseTuesday.com. January 26, 2012. Retrieved February 6, 2012. ^ "Skillet announces upcoming performance on Conan July 11 and plans to tour with Nickelback overseas this fall! - Skillet Official Blog". Skillet.com. Retrieved August 9, 2016. ^ "Russia tour". Retrieved August 4, 2014. ^ "The Roadshow 2014 Lineup to Feature Skillet, Third Day, Andy Mineo, Jamie Grace and More - Skillet Official Blog". Skillet Official Website. Retrieved October 5, 2014. ^ "Spring tour with Third Day". Retrieved December 19, 2013. ^ "Summer shed tour". Retrieved August 4, 2014. ^ "international summer tour". Retrieved August 4, 2014. ^ "Skillet To Play 2014 Rockstar Energy Uproar Festival - Skillet Official Blog". Skillet.com. June 17, 2014. Retrieved August 9, 2016. ^ "European fall tour". Retrieved August 4, 2014. ^ "Winter Jam 2015 Lineup Announced: Skillet Headlines Tour as Event Celebrates 20th Year". Christian Music, Christian Music News, BREATHEcast. Retrieved October 29, 2014. ^ "GRAMMY® Nominated Skillet Embarks On International Summer Festival Tour Hitting UK's Download, Germany's Rock Am Ring & Rock Im Park And More". Skillet Official Website. Retrieved May 16, 2016. ^ "Skillet Announce 2016 U.S. Tour Dates". Retrieved December 20, 2016. ^ "Skillet Book 2017 Tour With Sick Puppies + Devour the Day". Retrieved December 20, 2016. ^ "Korn + Stone Sour Announce 2017 Summer Tour". Loudwire. Retrieved August 3, 2017. ^ "Air1 - Positive Hits". Air1. Retrieved November 14, 2017. ^ "Winter Jam 2018 Rolls with Top Rockers Skillet". www.newreleasetoday.com. Retrieved January 29, 2018. ^ "Skillet Music". www.facebook.com. Retrieved January 29, 2018. ^ Jones, Brandon (January 28, 2019). "Lacey Sturm Fills in For Jen Ledger on Upcoming Skillet Tour Dates". Indie Vision Music. Retrieved January 28, 2019. ^ Durlin, Matt. "The Protest Drummer Jarob Bramlett to Fill-In on Select Skillet Dates". RockOnPurpose. Retrieved April 1, 2019. ^ "Skillet's "Monster" Recognized As Biggest Digital Single In Christian Music History". Retrieved February 3, 2016. ^ "'Skillet's' 'Jen Ledger' Named 'Rising Star' in Drum Magazine's 2012 Drummies Award". The Metal Resource - mauce.nl. July 3, 2012. Retrieved March 30, 2018. ^ "Skillet Win Best Rock Album in the Loudwire Music Awards". Loudwire. Retrieved October 29, 2014. ^ a b c "Best Band, Best Album, Best HM Cover - Skillet - The HM Awards". YouTube. Retrieved October 29, 2014. ^ "Drake, The Chainsmokers Lead Nominees for the 2017 Billboard Music Awards". Billboard. Retrieved April 12, 2017. 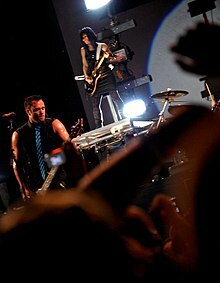 Wikimedia Commons has media related to Skillet.